Visit Yellowstone. We can help get you there! Filled with breathtaking views everywhere you turn, Yellowstone National Park is unlike any other. Yellowstone was the world’s first national park and is located in parts of Wyoming, Montana and Idaho. There are 5 different park entrances that allow over 4 millions visitors to explore the park each year. 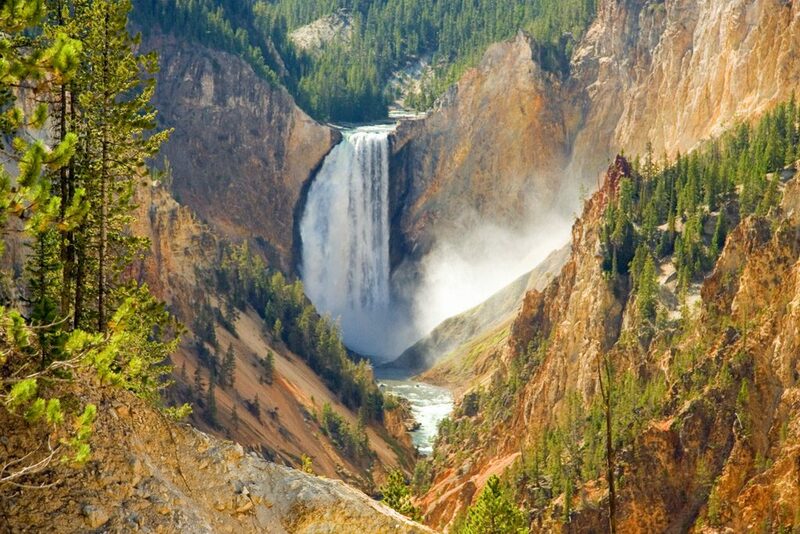 Visit Yellowstone to enjoy swimming, rafting, biking, fishing, exploring, hiking, camping and sightseeing. If you’re lucky, you will see some wildlife too. Here are a few things to see and do while visiting Yellowstone National Park. Twenty miles long, the Grand Canyon of Yellowstone is the most breathtaking sight inside Yellowstone National Park. This canyon widens up to 4,000 feet and is 1,200 feet deep in places. Take a closer look by walking down the stairs to different viewing points. Make sure to view both the Upper and Lower Falls of the canyon. 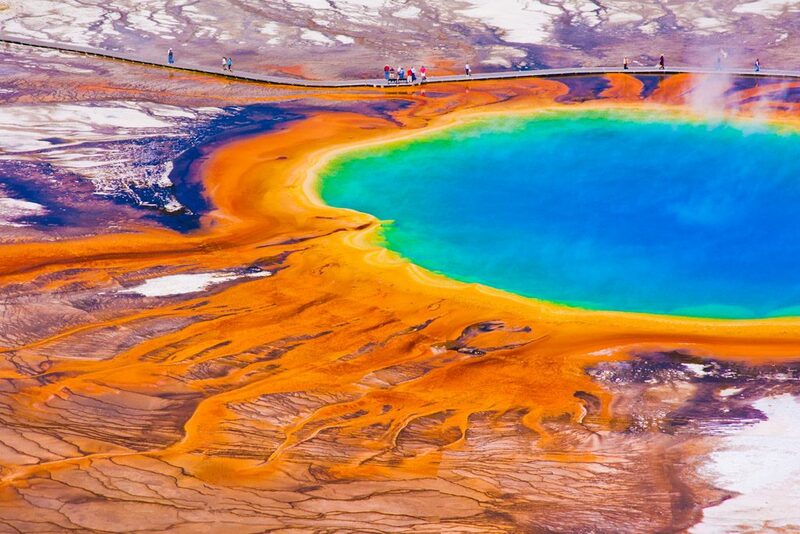 Deeper than a 10-story building, the Grand Prismatic Spring is the most photographed thermal feature in Yellowstone. Grand Prismatic Spring is larger than a football field and the hot spring has bright bands of orange, green, blue and yellow water. Make sure to stop and take pictures at this beautiful site in Yellowstone National Park. We promise you will never see anything like it ever again! Old Faithful Geyser is a famous icon of Yellowstone National Park. Erupting about every 74 minutes, Old Faithful shoots out hot water from 100-140 feet high. An eruption can last from 1.5 minutes to 4.5 minutes long. During this eruption, 3,7000 to 8,400 gallons of water can be expelled out of the geyser. When visiting Old Faithful Geyser make sure to stand back on the dock because the water temperature has been measured at 204 degrees Fahrenheit with steam reaching temperatures above 350 degrees Fahrenheit! 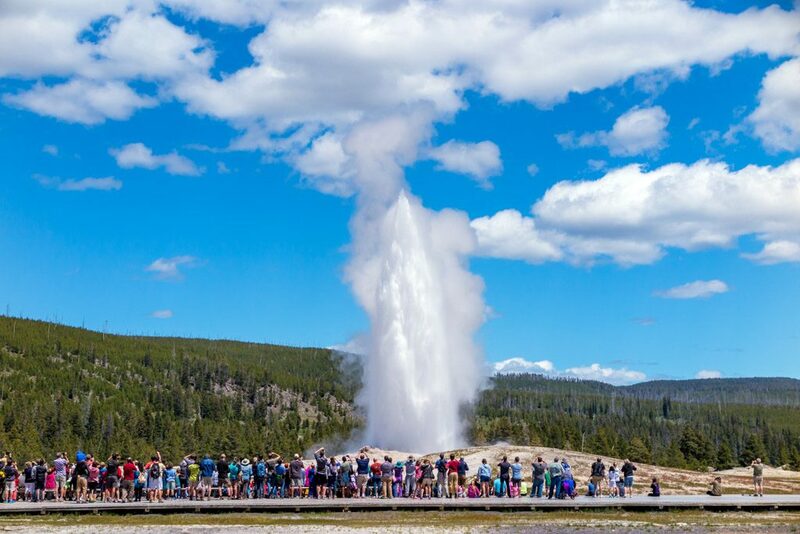 We promise seeing Old Faithful erupt in person is definitely a site you will want to see when visiting Yellowstone. 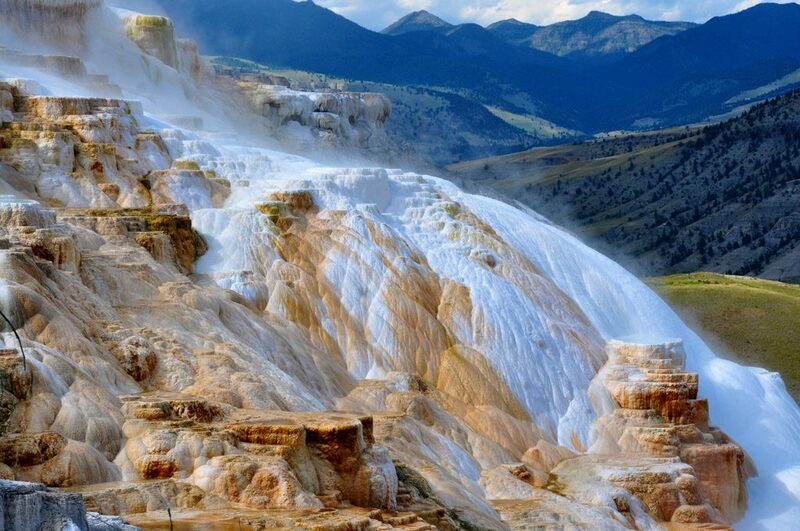 Next time you decide to visit Yellowstone National Park, Mammoth Hot Springs is a must see! It may look like something out of a fairy tale because it is the remnant of a volcanic explosion that happened over 600,000 years ago. Make sure to visit both the Upper and Lower Terraces at Mammoth Hot Springs. There are about 50 different hot springs that lie within that area. 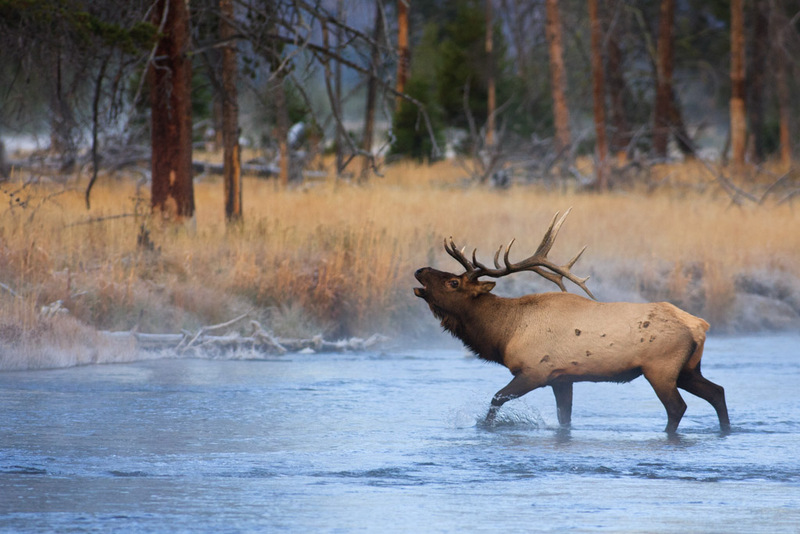 Come to Yellowstone to experience wildlife like you’ve never seen it before. Many times seeing wildlife is strictly luck and coincidence. However, early morning and evening hours are when animals usually come out to feed. Keep your eyes out for wildlife when going through the park. Sometimes animals like buffalo or bison cross the road right in front of your cars. If you’re lucky you may even see a bear off the side of the road! It’s time to visit Yellowstone National Park! Spend your nights sleeping under the stars at Yellowstone National Park. Yellowstone offers 12 different campgrounds with over 2,000 sites for their visitors. You can reserve campgrounds online to ensure that you have a good spot. You won’t beat the views you’ll have when you go camping at Yellowstone National Park! If you are in the mood for some hiking, then Yellowstone National Park is the place to do it! Yellowstone encompasses more than 2.2 million acres and has more than 900 miles of hiking trails. Explore the natural beauties that Yellowstone National Park has to offer. Hike to the backcountry and set up camp under the stars for the night. Visit Yellowstone for breathtaking hiking views unlike any other! We love taking our riders to various National Parks. We will take you to Yellowstone National Park so you can experience views unlike any other! Book a trip with us and then sit back, relax and enjoy the ride. We provide charging outlets for our riders, so you’ll stay connected. Here at St. George Express, we can take you places. St. George Express is making stops in Las Vegas now! This summer is going to be a hot one so we made a list of 5 ways to beat the heat in Las Vegas summers! About 15 minutes from the Las Vegas Strip is Wet ‘n’ Wild Water Park which has more than 25 slides and attractions! This water park has many exciting slides for the older kids and adults looking for a thrilling ride, like the six story vertical drop slides of Canyon Cliffs. This the perfect place to escape the heat during the Las Vegas Summers. A short drive off of the Las Vegas Strip is the Silverton Hotel and Casino which has a great free aquarium. The 117,000-gallon reef aquarium has over 4,000 tropical fish along with stingrays and sharks. The aquarium also features stingray feedings and live mermaid shows! Close to the aquarium is also a fresh water aquarium that is filled with koi fish. Take a second to cool down and wander through the garden at Flamingo. The garden is populated with pink Chilean flamingo as well as turtles, ducks and swans. In addition to the wildlife there are some lovely waterfalls and koi ponds to peer into. This perfect oasis will make you feel like you are in another world. Fremont Street is worth wandering down just because, but the light show is an added bonus! The pedestrian mall is covered by a 1,500-by-90-foot screen with 12.5 million LED lamps. When the sun sets the free Viva Vision light show runs every hour on the hour and is set to popular tracks by Heart, Bon Jovi, The Who, and more. This definitely an experience you don’t want to miss during the Las Vegas Summers! If you need a break from the overwhelming sights of the Strip, Marjorie Barrick Museum at the University of Nevada, Las Vegas has visual arts exhibits from international artists and UNLV students. Entrance is free and there is enough art to wonder around for hours! Located 250 miles south of Salt Lake City and 180 miles north of Las Vegas lies the beautiful Cedar City Utah. Nicknamed “Gateway to the National Parks”, Cedar City is the perfect place to set up base camp because it’s an hour from Zion, 90 minutes from Bryce Canyon and 3 hours from the North Rim of the Grand Canyon. Come to Cedar City to enjoy festivals for wild flowers, cars, films, music and Shakespeare. You can also enjoy beautiful sites likes Cedar Breaks National Monument and Dixie National Forest. Check out the list of our top 5 things to do when visiting Cedar City Utah below! Open every day of the year, Cedar Breaks National Monument is a must see on your next visit to Cedar City Utah. Sitting at an elevation over 10,000 feet, Cedar Breaks “is shaped like a giant coliseum dropping 2,000 feet to it’s floor.” Enjoy breathtaking views, colorful arches, columns and intricate canyons. Spend the day hiking, picnicking, camping, sightseeing, and taking beautiful photos. The best time to visit is during the summer and fall seasons from late May to mid-October. You can also come during the winter season from mid-October to late May and enjoy winter recreation activities. 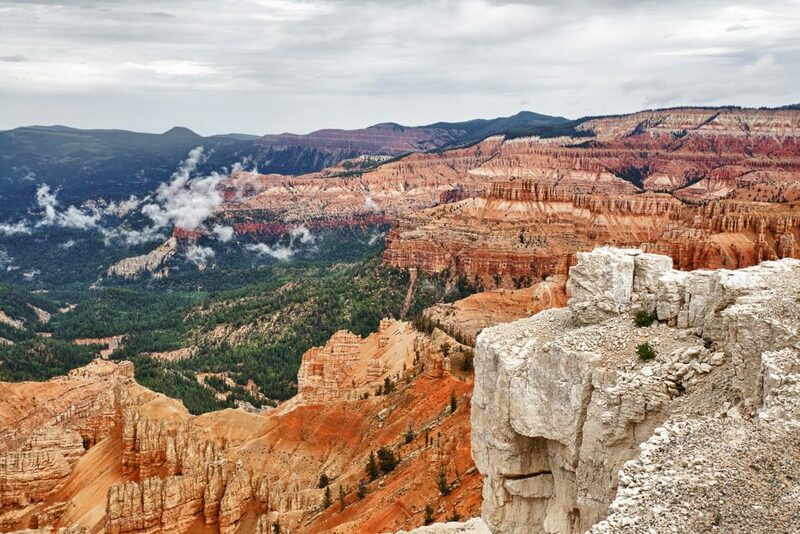 Visit Cedar Breaks National Monument for only $6.00 and enjoy going back again because a pass is good for 7 days. Founded back in 1961, The Utah Shakespeare Festival presented its first season to an audience of 3,276 visitors in 1962. Today, the audience is over 100,000 with nearly 300 plays each year. The Utah Shakespeare Festival features three theaters where these plays take place in during a sixteen-week season. This is a year-round operation with over thirty full-time employees. Each year, the Festival produces eight professional plays. Visitors from all over come to watch and be entertained by these plays. The Utah Shakespeare Festival also offers a variety of activities for it’s visitors such as seminars, classes, workshops, and backstage tours. Enjoy the Utah Shakespeare Festival next time you come to Cedar City Utah! 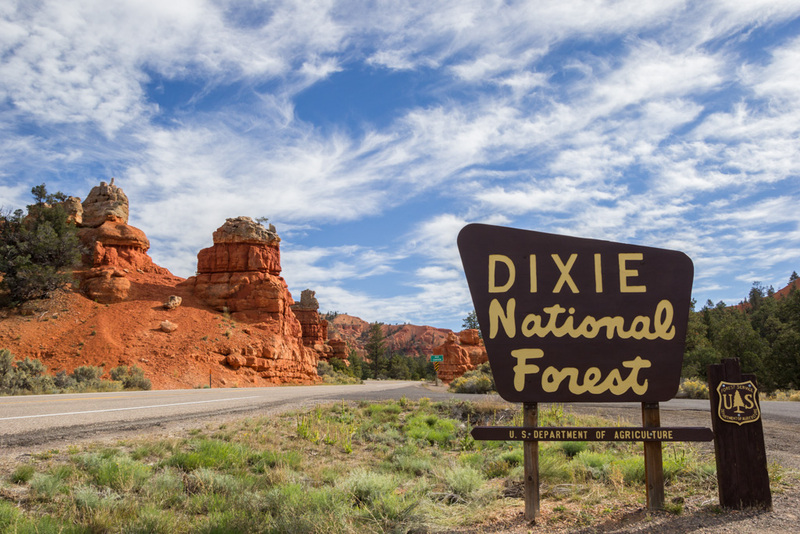 Dixie National Forest occupies almost two million acres and stretches for about 170 miles across southern Utah. The Dixie National Forest is the largest National Forest in Utah. Experience rolling hills, forests, plateaus, and desert-type plants. The forest experiences temperature extremes that are constantly changing. During the summer, temperatures exceed 100 degrees Fahrenheit and drop to -30 degrees Fahrenheit on the plateau tops during the winter. Visitors can enjoy hiking, hunting, horseback riding, fishing, swimming and camping during the summer. You can also try skiing, sledding, and snowmobiling during the winter. Whatever time of year you decide to visit; we promise Dixie National Forest will be site you won’t want to miss. Learn the story of development in Iron Country by visiting the Frontier Homestead State Park Museum. In 1850, Brigham Young sent Mormon Missionaries to Cedar City, Utah to mine and process iron. At Frontier Homestead State Park, you can visit historic cabins and see Cedar City’s oldest remaining brick home, the Hunter House. Visit the museum to see horse-drawn vehicles used from 1850 to 1920 along with other pioneer artifacts. You can purchase a day pass for only $4 a person. Come enjoy hand-on activities throughout the year at Frontier Homestead State Park in Cedar City, Utah. When it comes to star gazing, Utah is a great place to do it! Visiting Cedar City Utah, you are close to some of the top places to star gaze in Utah. The second best place to see the stars is at Cedar Breaks National Monument. Make sure to check the moon phases before going star gazing. You want to go on a night where there is little to no moon at all. Go out away from city lights and let your eyes adjust to the darkness. You can download apps on your phone to help you see and point out different stars in the night sky. 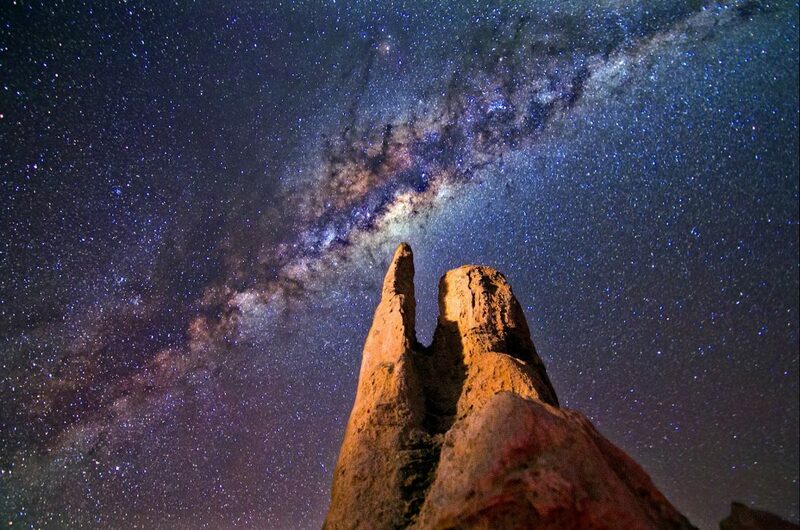 Try spotting the milky way and taking a pictures of it. It’s March, and you know what that means basketball fans?? March Madness! Vivint Smart Home Arena will be hosting games for the first and second round of the 2017 NCAA Tournament. Come enjoy the March Madness in SLC soon! March Madness in SLC will be happening on March 16th and 18th. This is the first time since 2013 that Salt Lake City will host tournament games. If you’re in an area close to Salt Lake City, you won’t want to miss out on this opportunity. If you want to see March Madness in SLC, we want to help get you there! March 12th is the official release date for the NCAA tournament bracket. It will be released between 5:30 p.m. and 7:30 p.m. EST that night. Keep your eye out for the tournament games scheduled to be in Salt Lake City this year. One of your favorite teams could be playing during March Madness in SLC this year. If you don’t have a favorite team playing in Salt Lake City, you can still come and experience the madness of March. March Madness in SLC is sure to have some great games, miracle comebacks, and the classic upset. Wouldn’t it be great to see one of those happen in person? You never know, this could be the year that a number 1 seed losses to a 16. You wouldn’t want to miss out on that piece of history! Come and watch some of the NCAA’s best players lead their teams to victory on the road to the Final Four! Experience the joy and heartbreak of 2017 men’s tournament. The St. George Express has some great drop off locations in Salt Lake City. The Salt Lake City airport and the downtown drop off are your two best options. These locations are about 1-8 miles away from Vivint Smart Home Arena. Have some time before the games? Each location has a lot of great options for you to pass the time. Spend some time walking around Temple Square, shop at the City Creek Mall, or get a bite to eat. If you don’t want to pay for an overpriced hot dog at the game, try eating at one of these places near the arena before you go. If you want to go to March Madness in SLC, take the St. George Express! We provide shuttles between St. George and Las Vegas. 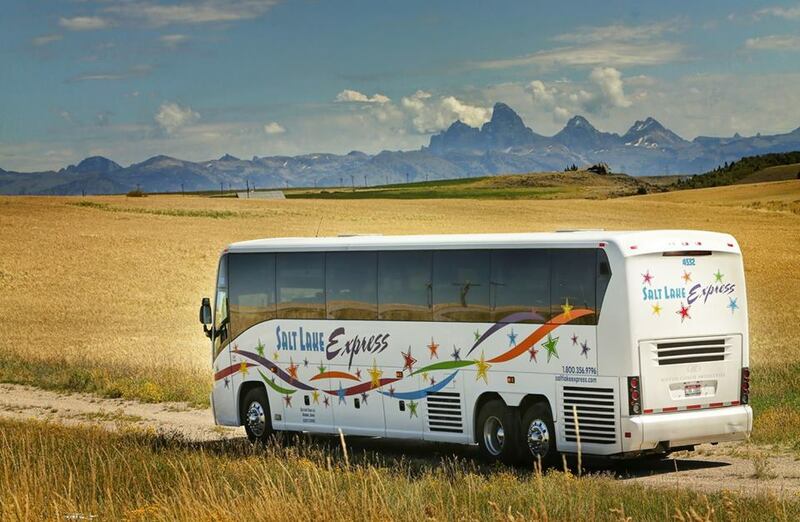 If you live in or near one of those locations, the St. George Express is a great way for you to travel to Salt Lake City. Book your trip to March Madness in SLC today! Finding the shuttle service St. George locals can count on is possible. Learn more about St. George Express today and see why you should travel with us next time you head out of town. We offer competitive pricing, great perks and customer service that you can rely on. Learn more about the shuttle service St. George residents travel with often. We do our best to provide the lowest pricing on our routes. We implemented a new system this past year to help you find even lower fares which we call EXPRESS DEALS! Similar to pricing plans like Southwest Airline’s “Wanna Get Away?” promotion, we have been able to set up a system where we can offer lower pricing on certain routes and time of day travel. Go through our booking tool and put in your information. Once you submit this form, you will be taken to the route options. On the left hand side, you will see listing options that include regular priced routes and our EXPRESS DEAL routes. These deals will be the best priced options on that day, which helps you save money! Next time you travel with us, book with our Express Deals! The shuttle service St. George visitors and community members use often works hard to provide the best amenities and perks. When you travel with St. George Express, you are provided with executive service, always. We are currently rolling out charging outlets, water bottles and more on all of our shuttles and buses. When you travel with us, we do our best to make sure you are comfortable and taken care of. If you have any questions or concerns, we are happy to address them and make sure you are taken care of. Our goal is to make your trip stress-free and easy, so book with us and let us show you why you can trust St. George Express. We are avid fans of social media. We use both Facebook and Instagram to connect with our valued customers. Follow us on Facebook or Instagram today and gain access to special discount codes, contests and more. We like to reward our customers and love being able to share free or heavily discounted shuttle services on a regular basis. Connect with us today and better your chances at winning some St. George Express credit! The Shuttle Service St. George Community Member’s Love. At the end of the day, our goal is to provide the best travel options for our valued customers. When you book with St. George Express, we understand that you are trusting us to help you reach your destination. If you ever feel unsatisfied with our service, please call or email us. We want to make sure you are taken care of and that you receive the service you paid for. Book your next trip today and let us do the driving! 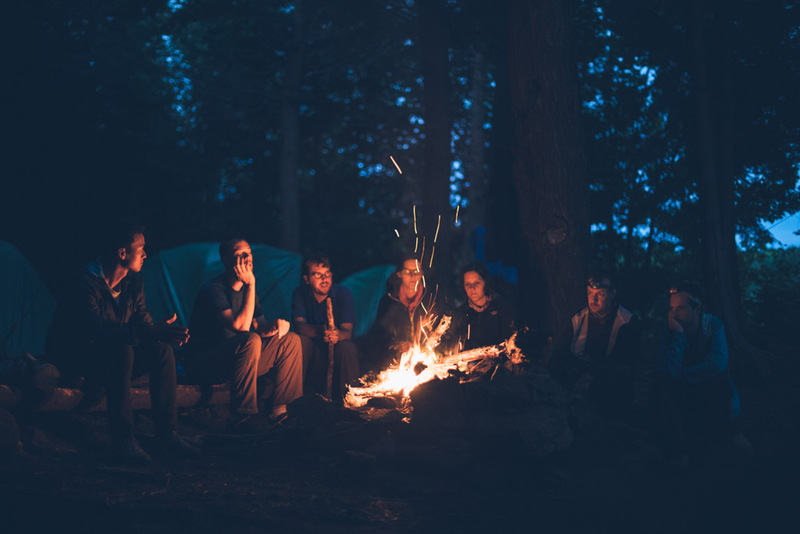 If you’re planning on going to Zion National Park anytime soon, you’ll want to come up with a list of activities to do while you’re there. We want to help you make the most of your time there. Here’s a list of a few great activities to try during your Zion National Park stay. Virgin River is a popular adventure spot at Zion National Park. Floating down the river is a great way to relax while enjoying the beautiful scenery around you. The Pine Creek waterfall swimming hole is less know, but is another great spot. Relax and enjoy your time in floating down the river or going for a swim! Zion Helicopters can take you on a flight over Zion National Park, as well as other parts of Southern Utah. Tours options include Snow Canyon, Red Cliffs Desert Reserve, and Quail Lake. Prices range from $45 to $299. Come take a look at the beauty of Zion National Park from a different view than you’re used to! If you want an exciting and unforgettable experience, Slingshot Zion is the place to go. Drive around while enjoying the beauty of Zion National Park and it’s surroundings. This a great activity for you if you’re looking for the ride of a lifetime. Zion Mountaineering School has a wide range of options for you to choose from. Hiking, rock climbing, mountain biking, canyoneering and more are available. All the guides have experience in and are passionate about these activities. The guides are ready to help you have a great experience doing whatever activity you choose. Zion National Park contains some beautiful scenery, a lot of which people never see. Safari’s make it easy for you to see the outback of Zion. There are 5 different tour options to choose from, ranging from two to nine hours. On your tour you can see a ghost town, native rock art, wildlife and more. Tour some of the backcountry and sand dunes of Southern Utah on a guided ATV adventure. Zion National Park has some of the most breathtaking scenery in the country. These ATV tours can be adjusted to your level of comfort. You won’t be asked to do anything you’re not comfortable with. ATV tours are all about being safe and having fun! We hope you’ve enjoyed our list. Zion National Park has a lot of great activities for you to choose from. We can help get you there! Book your trip today and save! Looking for a warmer weekend? Sounds like its time for a weekend getaway to Las Vegas! What’s better then enjoying the city lights, swimming pools, palm trees, restaurants, and not to mention all of the many things to do there! Below are our top 10 things to do and visit during your weekend getaway to Las Vegas! You can’t go to Vegas without making a pit stop at the famous Welcome to Las Vegas sign. This iconic sign is located just south of the Mandalay Bay Hotel & Casino on the Las Vegas Strip. You along with many other visitors can park in the parking lot and enjoy snapping a few pictures in front of the sign. This is a free attraction in Las Vegas and you can visit the sign 24 hours a day every day of the week! The perfect weekend getaway to Las Vegas starts at this famous sign! On September 30, 1935 the Hoover Dam was completed. With over 7 million visitors each year, the Hoover Dam is a wonderful place to take friends and family. Located 35 miles south of Las Vegas, the Hoover Dam is open daily from 9:00 a.m. to 5:00 p.m. Over 700 feet tall, the Hoover Dam separates the two states Nevada and Arizona. Enjoy walking around and site seeing at the Hoover Dam. You can also sign up for a tour to see more of the behind the scenes of the dam. It’s the perfect stop for your weekend getaway to Las Vegas! One of the most famous roads lies in Las Vegas. Anything and everything you will want to do will mostly be along the Las Vegas Strip. The Strip is 4.2 miles long and is considered a scenic route when driving at night. Fourteen of the world’s 25 largest hotels are along the Strip, with a total of over 62,000 rooms. The Las Vegas Strip offers many different things to do. Whether you’re in the mood for shopping, eating, gambling, or site seeing, it’s got it all. Just make sure to wear good walking shoes! Who doesn’t love M&M’s? There is nothing better then a whole store dedicated to delicious M&M candies. Right next door to the MGM Grand is the four story tall M&M World filled with anything and everything M&M. There you will find candy, M&M gift items, clothes, stuffed animals, office supplies, luggage, and so much more! Personalize your own M&M’s and watch them be made right in front of you at M&M’s My Color! Whether you have kids or not, this is a fun store for people of all ages to visit. Only 25 miles west of the Las Vegas Strip, you can enjoy the Red Rock Canyon. For a small entrance fee, hop in your car and drive along the one-way 13-mile scenic drive. Make sure to look out for stops along the drive. There are many places to get out and enjoy hiking or rock climbing. 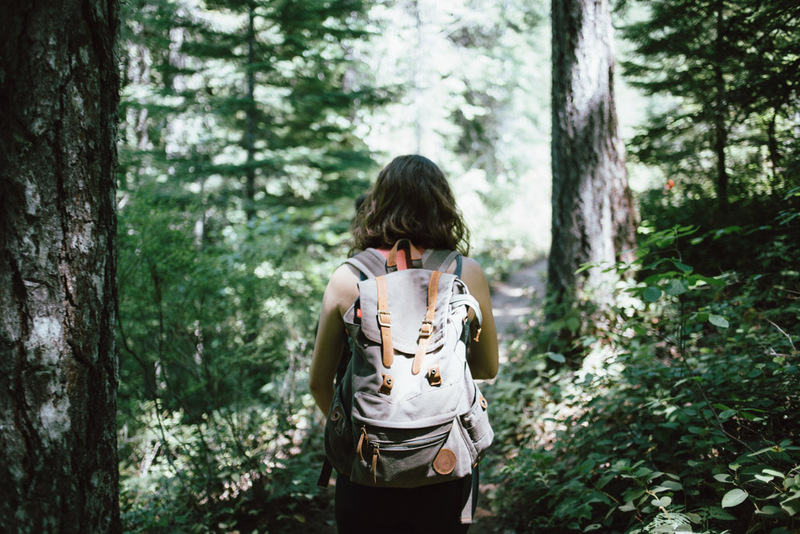 There are a variety of different hiking trails, ranging from easy to hard. Pack a picnic lunch and enjoy hiking in the Red Rock Canyon! You won’t want to miss out on this during your weekend getaway to Las Vegas. When visiting Las Vegas, seeing the Bellagio Fountains is a must! Directly in front of the Bellagio Hotel is a huge manmade lake that has over 1,000 fountains. These fountains provide a wonderful show of choreographed dancing water accompanied with music and lights. This is a free show that takes place every half hour until 7 p.m. and then happens every 15 minutes until midnight. We definitely recommend seeing this show in the evening when you can see all the lights and water lit up! Find out more about the show times on their website. Are you an aquarium lover? Then the Shark Reed at Mandalay Bay is for you! This unique Shark Reef gives you a cool insight to life underwater. This aquarium as 14 different exhibits that feature over 100 different sharks, piranhas, rays, sea turtles, crocodiles, and other exotic fish. You can also enjoy the touch pool that allows you to feel different fish or sting rays. Enjoy the walk through tunnel and enjoy underwater life all around you. We promise this is an attraction you won’t want to miss! This will definitely be a highlight of your weekend getaway to Las Vegas! Located on Las Vegas Blvd. just north of the Strip you will find Stratosphere Las Vegas. This signature attraction is the tallest freestanding observation tower in the United States. Standing at over 1,149 ft. tall, the Stratosphere Las Vegas is not only a hotel and casino but is pretty much a theme park as well. Head to the top of the Stratosphere to find the ride Insanity. This ride extends you 64 feet out over the edge of the Stratosphere. There you will enjoy an insane ride and a breathtaking view of Las Vegas! Located in the Bellagio Hotel under a huge glass dome is the Conservatory and Botanical Gardens. Open 24 hours a day, the Conservatory and Botanical Gardens are free to enter for all guests. Enjoy looking at stunning beautiful season scenes that over 140 horticulturists have spent time arranging. Each holiday, they change the scenes as well. These scenes use flowers, plants, trees, lighthouses, gazebos and bridges to create unique visual scenes. This is a fun thing for people of all ages to enjoy! With over 75 different casinos, Las Vegas is the place to go to visit some world famous casinos. Most of the casinos are all concentrated along the Strip. Enjoy dining, relaxing at the pool, and staying at the beautiful hotels that are a part of these casinos. Some famous casinos are Caesars Palace, the Bellagio, MGM Grand Casino, and The Venetian Resort Hotel Casino. Maybe if you’re lucky, you’ll even witness a wedding! You never know when it comes to Las Vegas! It’s time to get to Las Vegas for your weekend getaway today! Your Weekend Getaway to Las Vegas Starts Today! Las Vegas is the perfect place for a weekend getaway to escape from your crazy busy lives. So why not? A weekend getaway to Vegas is calling your name. Experience fun attractions, go site seeing, spend the afternoon at the pool, or go see a show! Don’t want to take your own car or rent one? Then travel with St. George Express. Let St. George Express take you to your next stop destination. Let St. George Express take you to Las Vegas for your weekend getaway! They say, what happens in Vegas, stays in Vegas right? Find the St. George shuttle service that you will be able to rely on for all your shuttle needs because we listen to our customers and want the best for their needs. St. George Express: A Salt Lake Express company is here to provide the best service possible to the people of Southern Utah and to all the areas we travel to. Learn a little more about St. George Express and see what perks we offer to the people of St. George, Las Vegas and more! The worst thing about traveling is when your phone battery dies right? You finally get to your destination but now you are phone-less. We don’t like it when it happens and due to our valued customers questions and suggestions we have found a solution. That is why we have provided charging outlets on our shuttles, free of charge. We are excited to provide this feature and roll it out onto all of our fleet. The days of dead batteries are over. Charge your gadgets on St. George Express on your next trip. Traveling is fun and we want everyone to be able to do that. When you travel you want to save money while doing it because, well, who doesn’t love to save money where they can? That is why we came up with our EXPRESS DEALS! Similar to pricing plans like Southwest Airline’s “Wanna Get Away?” promotion, we have been able to set up a system where we can offer lower pricing on certain routes and time of day travel. When you book on our website, you will put in your route information and dates. Once you submit this form, you will be taken to the route options. On the left hand side, you will see listing options that include regular priced routes and our EXPRESS DEAL routes. These provide the lowest pricing possible for that trip criteria. Next time you travel with us, find our Express Deals and save money! We love to reward our valued customers. When you travel with St. George Express, you are treated like friends and family. We often provide promo codes and discounts on a variety of routes. We are currently promoting a $19 fare between Las Vegas and St. George. This is the lowest price you can find right now. Act fast and save on travel! We also like to reward customers who travel with us. We have been able to pick random passengers who ride with us to win our #RideToWin Campaign. You are automatically entered to win when you travel. One winner is selected every couple of months to win $500 cash! Who doesn’t want an extra $500 right? Book now for your chance to win! Get rewarded for traveling with the St. George shuttle service you can trust! The St. George Shuttle Service you can Trust! Travel with St. George Express today and enjoy all the perks we provide. We want to make sure our customers are happy and that they get to where they need to go. We also value and appreciate the feedback we receive our customers. Do not hesitate to let us know how we are doing. Book your next trip today and save!